(Left to right) Arlene Dams, Sydney Klonowski, Barbara Somerville, Cassidy Holderman, and Kassidy Quick gather for a picture after singing carols together at the event. Over 25 students volunteered for the event. Students helped decorate the Center with balloons and then mingled with the residents during the Prom. Full of twinkling lights, exciting music, and unforgettable memories, prom is often a highlight of students’ high school careers. It has been said that you can’t relive your high school years, but for some residents of the Citadel Care Center, they had the chance to relive prom Saturday December 10, 2016. Halle Schweizer, a senior at BBCHS, with the help of Student Council, has created a program to bring prom to the senior center. This was certainly the case at the prom Saturday afternoon. The room at Citadel Care Center in Kankakee was filled with balloons and music as residents and over 25 student volunteers gathered together. Danielle Kennedy, a senior at BBCHS, says her favorite part of the event was “making connections and spending time talking with the residents.” The event also impacted many of the residents. Joyce Wilson, 84, who attended a high school in Kalamazoo Michigan and remembers enjoying the dances there, says she enjoyed the “decorations, music, and beautiful Christmas tree” at the event. 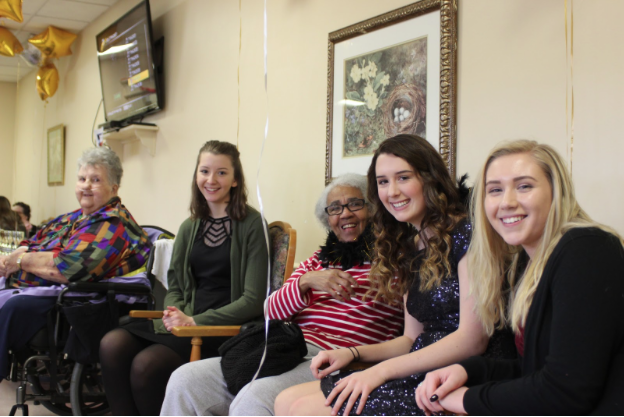 Other residents could be seen sharing their stories and memories with students or singing Christmas carols and snacking on refreshments. Because the prom was successful in bringing together both students and residents, Schweizer has high hopes for the future of the program, including a Hawaiian night and a game night. Schweizer notes “[her] ultimate goal is to see younger grades continue this program.” This will allow the program to continue impacting the lives of both students and the residents of Citadel. The quiet chatting accompanying the soft music of the Citadel Center may not be the images that come to mind when thinking of a traditional prom, but no prom experience could outweigh the impact this past Saturday had on the participants, both young and old.